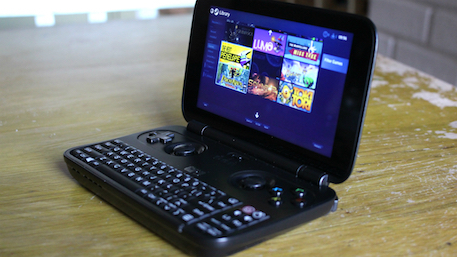 GPD Win review - "A PC in your pocket"
GPD is a company you may already be familiar with if you've followed the fascinating world of Android-based games consoles. 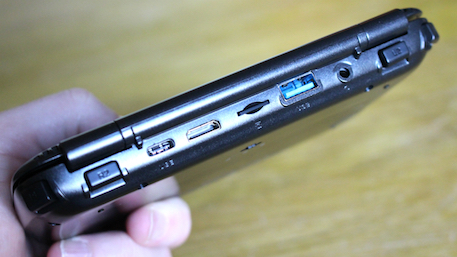 The firm released the excellent GPD XD a while back, a clamshell device which looked like a Nintendo 3DS on the outside but offered incredible emulation power on the inside. Now GPD is back with a conceptually similar handheld called the GPD Win, and as the name suggests this new device runs Microsoft's Windows 10 OS rather than Android. It's powered by Intel's Atom X7 Z8700 processor, has 4GB of RAM and boasts a full QWERTY keyboard – in short, it's a PC you can fit in your pocket. But it also has a strong entertainment focus thanks to its full suite of physical gaming controls. Does it deliver on the incredible potential of this idea? Let's find out. 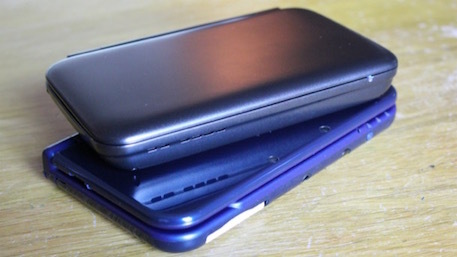 Like its forerunner the GPD XD, the GPD Win really does look like a dead ringer for the 3DS, at least when it's closed. However, opening up that clamshell reveals a roomy 5.5-inch, 720p touchscreen display, full QWERTY keyboard, and an array of gaming controls - the first hints that this isn't your typical portable console. The keyboard looks a little comical when you consider that it resides on what looks like a portable gaming system, but it allows you to input text with relative ease - perhaps not to the touch-typing standard you're accustomed to on a full-size keyboard, but it's welcome nonetheless. The gaming controls consist of a digital pad, dual analog sticks, and four face buttons, as well as a selection of buttons on the right-hand side of the keyboard which come into play when the GPD Win is in "Xbox" controller mode. There's a switch in the middle of the unit which, in its default central position, enables the analog stick-controlled mouse pointer. It can also be set to two different gamepad settings, one of which imitates the Xbox 360 controller. Overall, the gaming interface is decent. The D-Pad and face button feel a little on the spongy side but the analog sticks are great. On the rear edge of the device you'll find four very clicky shoulder triggers, a USB Type-C port for charging, a Micro SD card slot capable of accepting cards up to 128GB in size, a standard USB port, a 3.5mm headphone jack and a HDMI-out socket. On the base of the console there's a switch which controls the internal fan, included to keep the Atom chipset from running too hot. You can toggle between off, medium and high speed settings. On the right-hand side of the device you'll find the single speaker, the positioning of which represents perhaps the single biggest flaw in the console's design. The speaker has been placed exactly where your palm grips the unit when its in use, and it's therefore almost always muffled. It's possible to adjust your grip to open up the speaker, but it's not particularly comfortable. While there's a similar grille on the left-hand side of the device, don't be fooled – it's not another speaker but instead grants more airflow to the internal fan. The GPD Win's display is bright and has excellent viewing angles, and despite its 720p resolution it's more than adequate. As a touch surface it's snappy and responsive, which means you can use your finger to select items and commands. Although to be honest, you're better off using the right-hand analog stick and shoulder triggers, which stand in for a traditional mouse and work better than expected. The GPD Win may offer a full Windows experience right from the off, and can act as a PC if you so wish, but its main purpose is to play games. And it excels in this regard. It can run a wide range of PC games, while retro gamers will naturally be excited about the far-reaching support for various emulators. 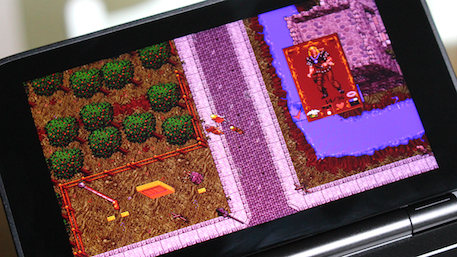 Emulation is at an advanced stage on Android, but on PC it's a whole other matter entirely. It may take longer to configure some of the emulators you download, but you'll find that customisation is better, you have more supported systems, and generally, Windows-based emulators benefit from more recent improvements. 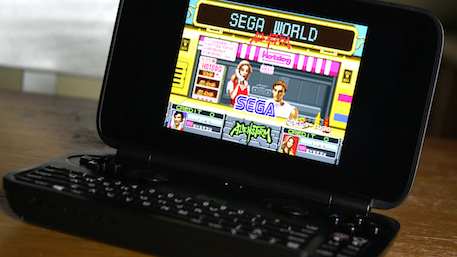 For example, the arcade emulator MAME is at a more advanced stage on PC than it currently is on Android. Intel's Atom X7 Z8700 isn't the fastest on the block when it comes to raw performance, but we were surprised at how well it handled all of the games we threw at it. 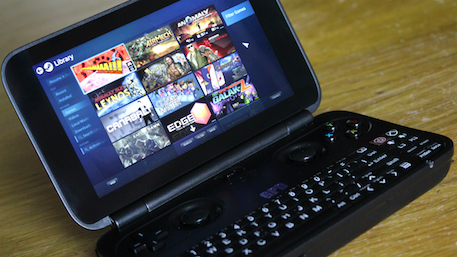 After installing Steam we downloaded a selection of titles to test just how well the GPD Win performed, and came away quite impressed. 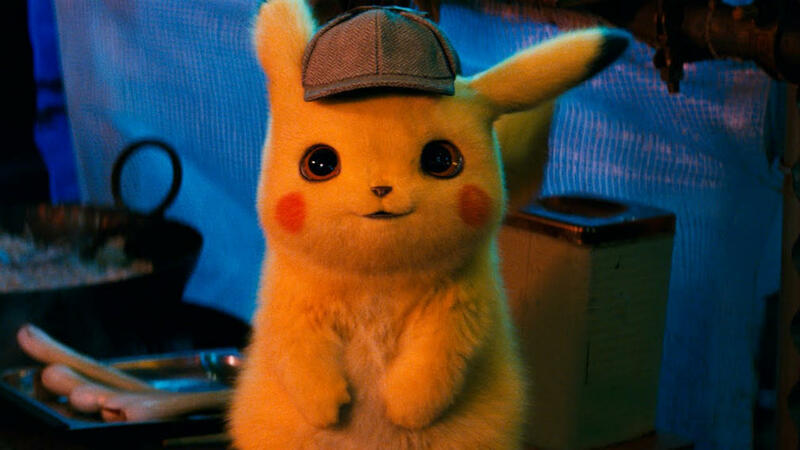 3D titles like Lumo, Owlboy, Bionic Commando Rearmed, Batman: Arkham Asylum, The Legend of Grimrock, The Next Penelope, and Galak-Z all ran smoothly. More recent PC titles are a bit hit and miss, which is hardly a shock when you consider the size of this console. 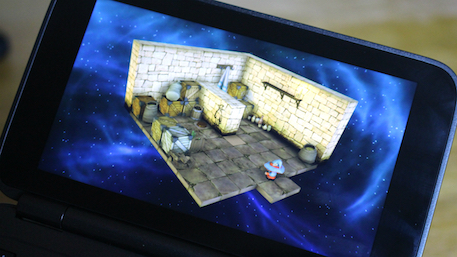 It would be churlish to expect the latest 3D masterpieces to be playable on such humble hardware, but we were genuinely surprised at how many games the GPD Win was capable of handling. Given that it's a PC, it's also possible to load up PC games from the past few decades on the GPD Win as well. Some will run fine in Windows 10, but older games may need DOSBox or another application. For example, Ultima VII can be run on the GPS Win using an app called Exult, which even offers improvements like high-res graphics. If you're a fan of early '90s point-and-click adventures then there's ScummVM, which offers access to the likes of Monkey Island, Sam & Max, and Lands of Lore. Given the heavy lifting the GPD Win has to do in order to give you a pocket-sized PC it's hardly surprising that it comes with a beefy 6700mAh battery. 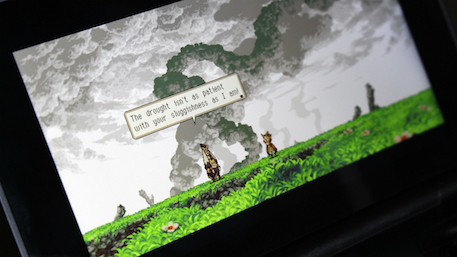 As you might expect, stamina is almost entirely relative to what you're doing. Running a Game Boy emulator isn't going to tax the hardware too much, but playing more recent 3D games via Steam does tend to soak up a lot of juice. On average we managed to get around three hours of varied usage, but it may be possible to extend that to as much as five if you're careful. The unit is charged via a USB Type-C port and it take almost two hours to fully charge the battery. There's 64GB of storage included here, of which round 20GB is occupied by Windows 10 itself. As you might imagine, after downloading a couple of games on Steam you'll see that storage get eaten up quite dramatically. The Micro SD card slot alleviates this issue a little, as does the full-size USB socket, which can take a USB memory stick for additional space. One of the best things about your humble PC is just how versatile it is, and the GPD Win takes this versatility and places it inside a pocket-sized device. While there are bottlenecks when it comes to power, you could easily use this as your "go to" computer if you wished. Just connect a screen, keyboard, and mouse and you've essentially got a mobile workstation. This in itself is pretty impressive. However, there's no doubt that the main focus of the GPD Win is gaming, and in that regard it's a very interesting product. While it isn't capable of playing the very latest PC games, as a portable emulation platform it is in a field all its own. Android-based rivals - like its stablemate the GPD XD - may be easier to configure, but they don't offer anywhere near as much flexibility or emulator support. If you're really serious about emulation and mobile gaming then this comes highly recommended - although its price tag of around £300 may give casual gamers pause for thought.